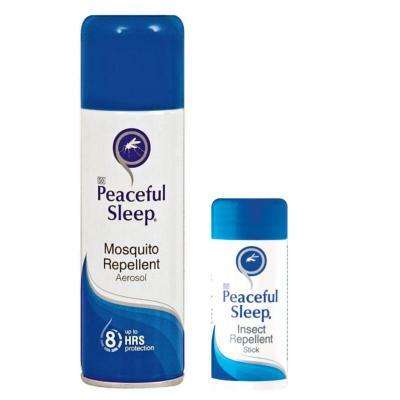 If you're travelling to tropical destinations, bite avoidance is key and Peaceful Sleep is one of the best repellents on the market! 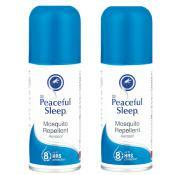 A South African repellent that's proven to prevent bites from insects, midges, flies and mosquitoes, Peaceful Sleep is trusted by rangers on safari as the best repellent for keeping the bugs at bay. 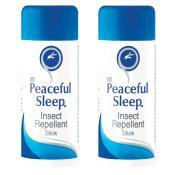 Peaceful Sleep is a clean, clear, non-greasy, non-sticky repellent that's resistant to perspiration. 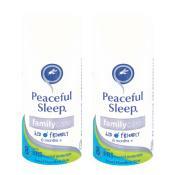 Available in both spray and stick format, this twin-pack provides one of each. Manufactured in South Africa to keep insects at bay when on safari, this light but effective repellent really works and is the number one choice for Safari Rangers. Containing 15% DEET as well as natural plant-based oils such as lemongrass and citronella, the easy to apply spray and stick does not leave a sticky residue, which makes it perfect for sensitive skin. It works hard to prevent painful and irritating bites. Mosquitoes can bite through thin clothing so lightly spray trousers turn-ups and tops for added protection. Use the stick to target smaller, sensitive areas such as the neck, ears, nose, wrists and ankles.